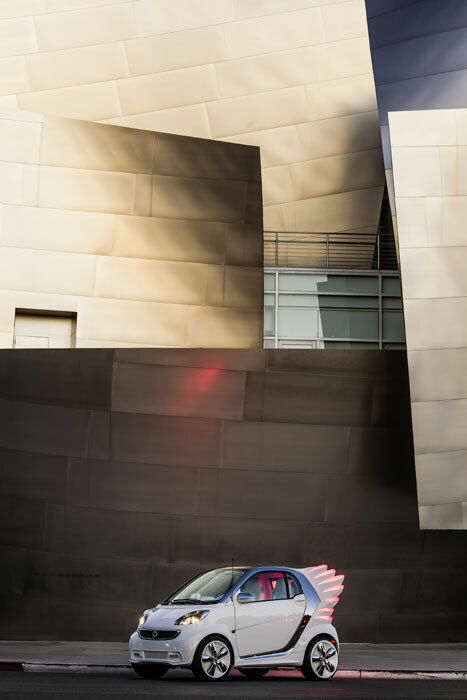 This week at the Jim Henson Studios in Hollywood Smart Car took the sheets off what will surely be its most talked about creation ever: the Smart Forjeremy fully electric vehicle. Smart were obviously going all out for the event, plying the couture crowd with plenty of top shelf booze and appetizers. The Bulleit Rye certainly made the “secret performance” more bearable, which was none other than LIAS obsession M.I.A. You know we love us some M.I.A. here, but homegirl phoned in her performance with a casualness that bordered on offensive. Maya not only forgot lyrics to the 3 songs she played (“Bamboo Banga”, “Paper Planes” & “Bad Girls”), but seemed to give her performance about as much attention as a pedicure. As she left the stage, I could swear I heard her ask her DJ where the closest bank was to cash her check. But I digress. While M.I.A. performed, the true star of the night elevated out of the floor and was shown to the public for the first time. 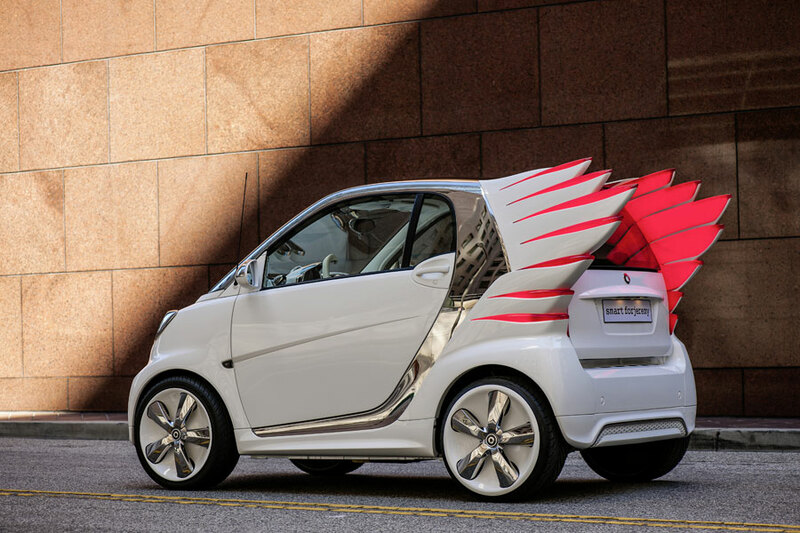 Clearly, the Smart Forjeremy will be — just like everything else that springs forth from the mind of Jeremy Scott — a very polarizing creation. Nothing the American designer ever does comes without heaps of praise and criticism, as his style is ultra whimsical in a world of pretentious gravity. Having outfitted everyone from Madonna, Rihanna and Katy Perry to Kanye, Björk and Nicki Minaj, it’s no secret Scott likes keeping it playful. No, not everyone wants to wear teddybears on their feet, but not everyone has to either. At least with Scott around, you have that option. 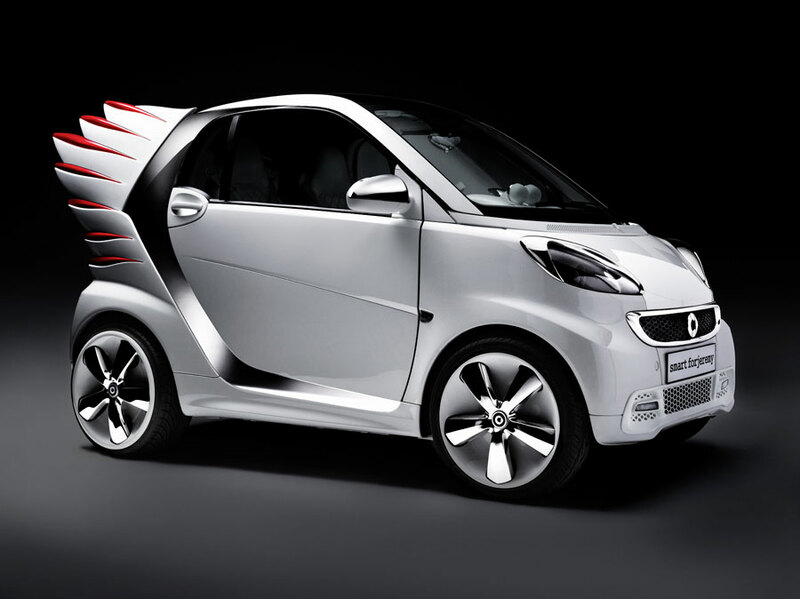 That’s why the Smart Forjeremy is such a breath of fresh air. Automotive collaborations with fashion houses are nothing new, almost hackneyed at this point. The formula is predicable: take a car the Marque is trying to promote, align it with a well known (and usually luxury) design house, and watch the blogs go Lady Gaga. The only problem is that rarely, if ever, does the partnership create anything original, of true singular value. 99% of the time, the “Collaboration” is limited to the interior getting swathed out in the designer’s signature print in signature colors (I’m looking at you, Hermès Bugatti, Lamborghini Versace and FIAT Gucci), with some some gold-plated badges and a little embroidery thrown in, and BAM!, your efforts in Marketing 101 have been completed. 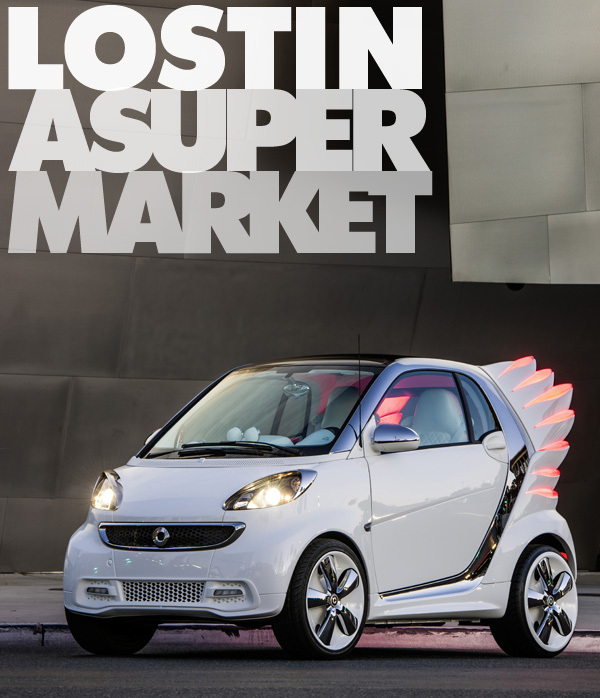 Not so with the Smart Forjeremy. 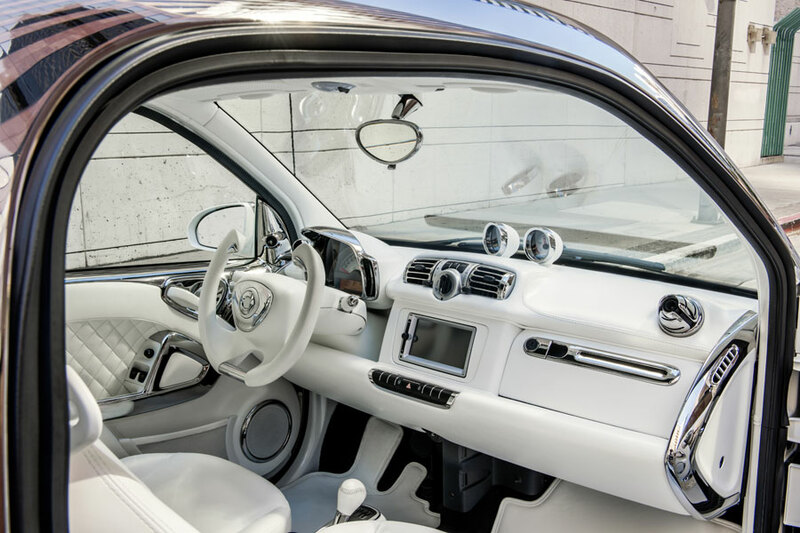 For the first time ever, an auto manufacturer is allowing the designer to change the physical exterior of the car. 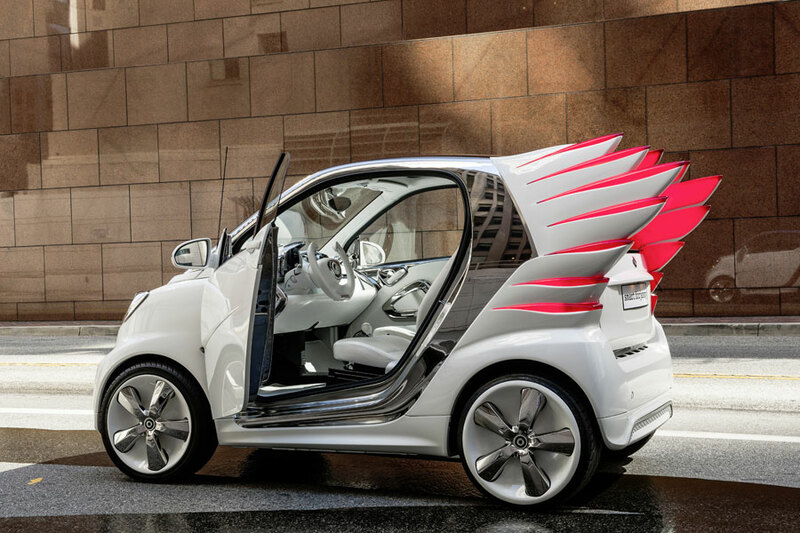 That is an important and relevant distinction, and one carried out to a dramatic effect with Scott’s iconic wings added to the back of the EV. 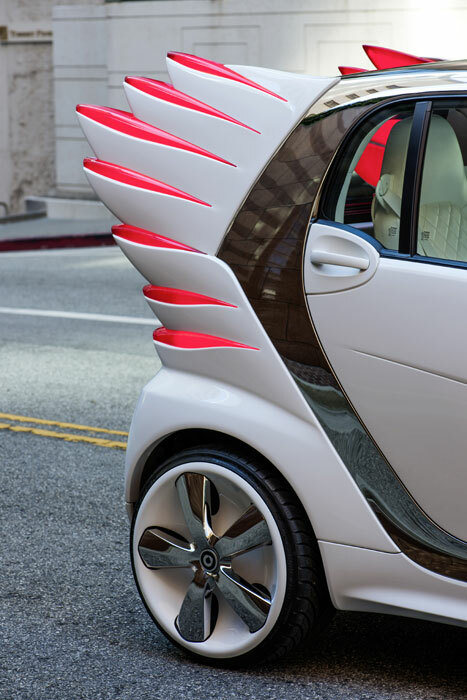 The transparent fiberglass wings are augmented with red LEDs that function as break lights, giving the Smart forJeremy a salient visual impact. 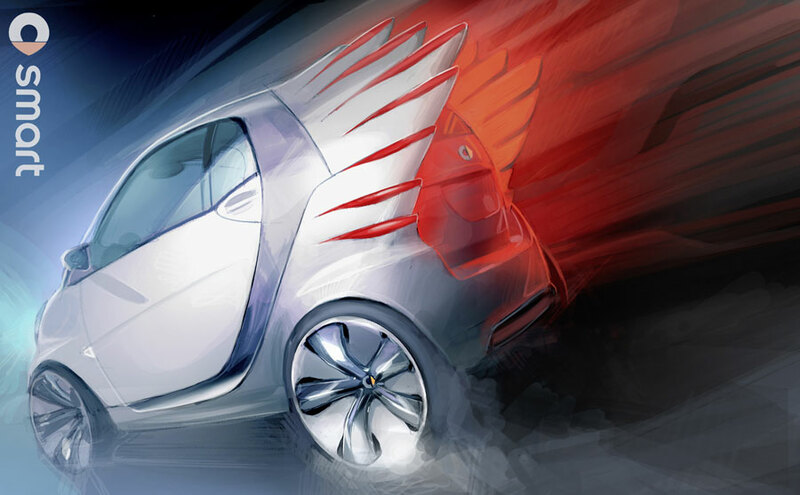 The bright red and brilliant white of the car create a Pegasus-like effect, clean and cosmic. 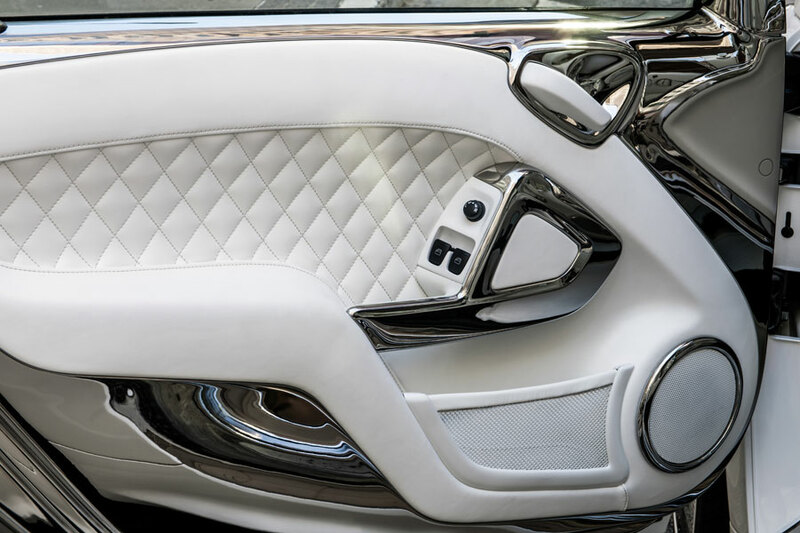 Other details — like the propeller rims and headlamp “eyelashes” — are dipped in mirror-like chrome, adding to the fantasy aspect of the car. 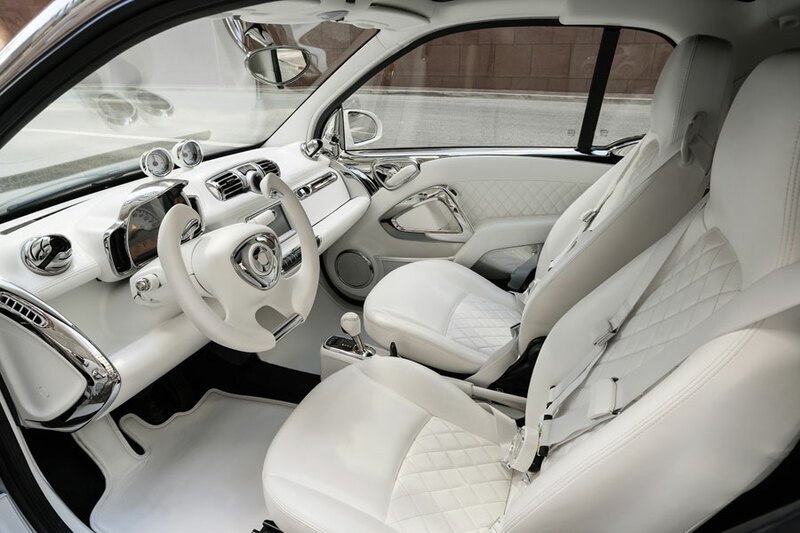 Interior-wise the Smart forJeremy flashes its luxury cred with diamond-stitched seats, and a cocoon-like cockpit wrapped in brilliant white Nappa leather. Other details, like the air vents, also get the chrome treatment. 5-point racing harness seats, crimson ambient lighting and a steering wheel inspired by 1980s video games completes the package. 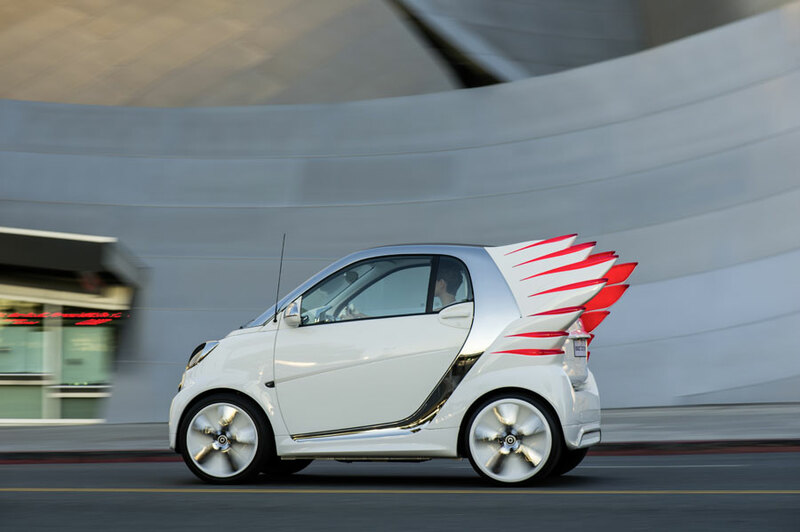 Based on Smart’s new Fourtwo Electric Drive powertrain, the Smart forJeremy is powered by a 75hp electric engine that accelerates from 0 to 62 mph (100 km/h) in a very respectable 4.8 seconds, although the speed tops out at about 77 mph (125km/h). 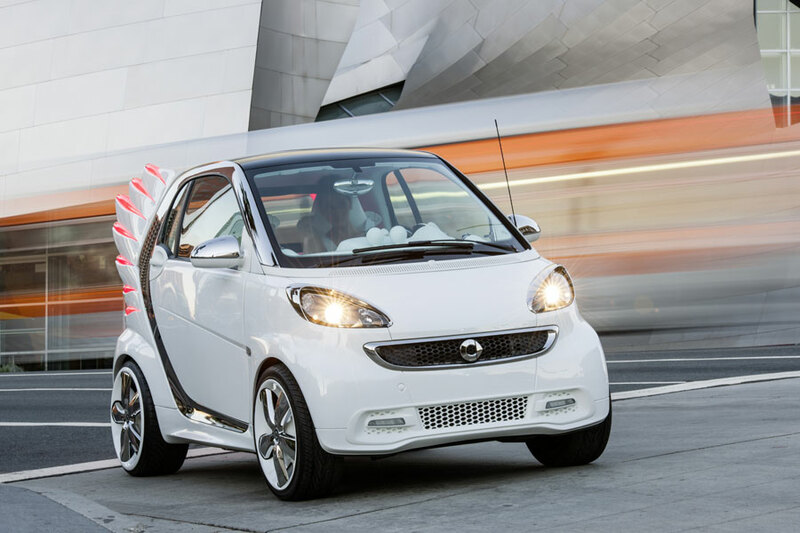 But the Smart forJeremy is made for urban environments where acceleration — not top speed — is at a premium. And with a range of about 90 miles (145km), one should look at the Smart forJeremy as a capable intra-city commuter, not a Vegas roadtripper. 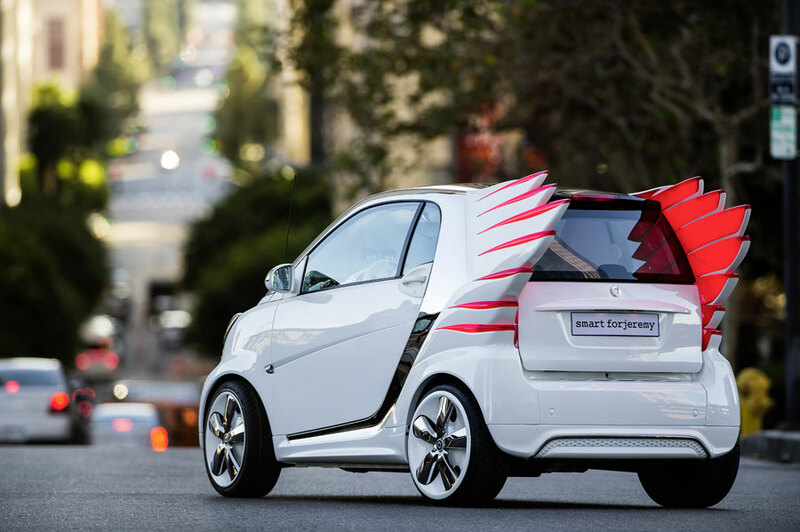 The most unbelievable aspect of it all is that Smart announced its intentions of bringing the Smart forJeremy into production. And even more wild, the car will retain its wings — although at about 50% of the size that they are in the concept vehicle. Bravo. In a world of predictable collaborations, this concept has the potential doing something very unique. Although we’ll reserve final judgment until we see the production version — you never know how much a car can change during these stages. 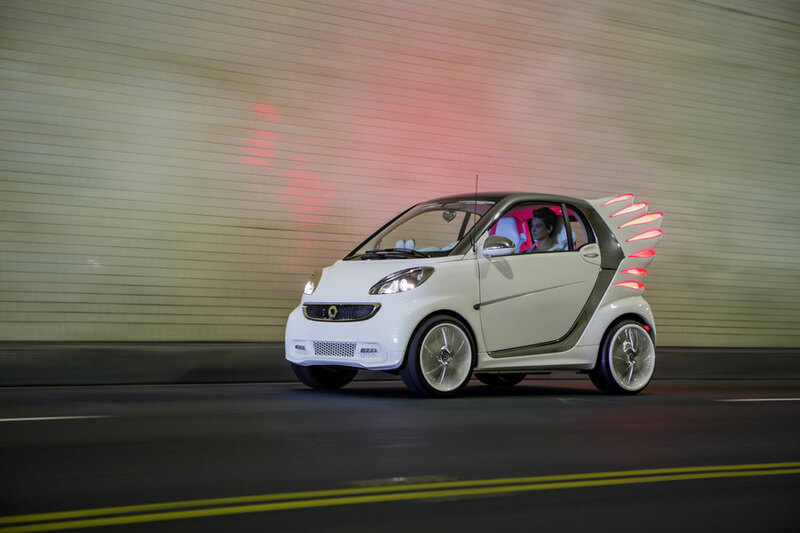 We won’t have to wait long to find out, as the Smart forJeremy is set to launch in early next year across Europe and the US. love the theme/design), I don’t have time to browse it all at the moment but I have bookmarked it and also added your RSS feeds, so when I have time I will be back to read more, Please do keep up the awesome job.